After the success attained by Aaple Sarkar Application, the Maharashtra State Government’s Grievance Redressal Portal in the six districts it was launched in, CM Shri Devendra Fadnavis launched the second phase of Aaple Sarkar on the 67th Republic Day. During the first phase, 46 services under the Right to Service went live; with the second phase, 109 government services have gone live. A total of 156 services can be accessed by the public using this portal. This citizen centric portal, which allows citizens to file Right to Information, raise grievances, and even lend their suggestions, was developed by Silver Touch Technologies Limited. Apart from the portal, Silver Touch had also developed a mobile app to offer more convenience, transparency and mobility to the citizens, thus improving communication. The first phase, launched in 2015, witnesses over 24000 grievances, of which 19500 have been redressed. The number of RTS applications registered is about eight lakhs. The numbers are witness to the fact that digital revolution has indeed facilitated communication between the Government and the citizens. “We are just half-way through the digital state mission we have started. Our target is to make the state 100% digital with all services going online, by 2nd October 2016. 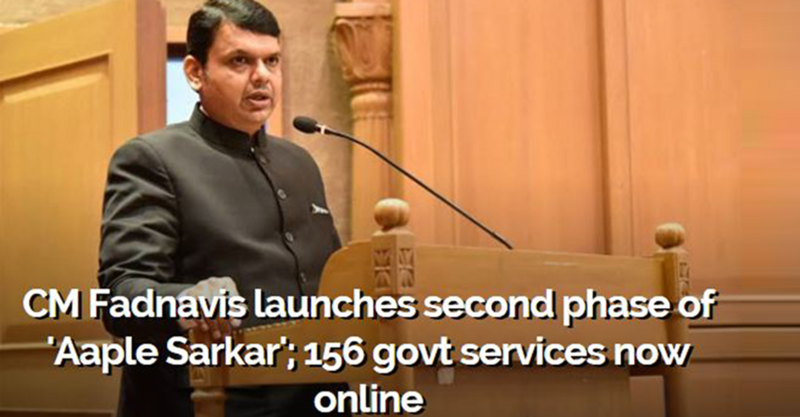 The aim to achieve complete mobility for all the services” Said CM Shri Devendra Fadnavis. The government is planning on setting up more than 40,000 Aaple Sarkar centers across Maharashtra to offer more digital convenience to the citizens.